When it comes to buying flooring for your Colorado home, there’s only one store in the Vail Valley to visit: Ruggs Benedict Carpet One Floor & Home, located in Avon between Vail and Beaver Creek. Having served the Vail Valley for 40 years, you can be confident that you are working with flooring experts. From design and selection, all the way through installation, we have the experience that makes a difference! In recognition of Ruggs Benedict’s great service to their customers and their community, Ruggs Benedict was honored as 2009 Business of the year by the Vail Valley Partnership. 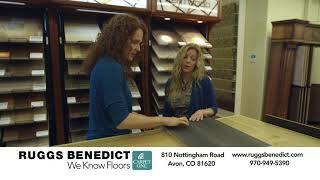 At Ruggs Benedict Carpet One Floor & Home, we know floors. Be sure to visit us in Avon to take advantage of our expertise.